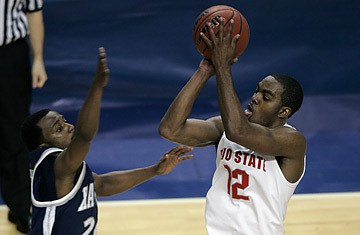 Ohio State guard Ron Lewis, top right, hits a three-point bucket over Xavier's Drew Lavender, left, and Justin Cage to tie the game in the closing seconds of the second half against Xavier. That they foul the freakin' guy! It is perhaps the most rational strategy in all of sports, yet every March, and throughout the college basketball  and NBA  season, elite coaches fail to make a move that any barstool Bobby Knight would surely recommend (and will surely scream at the TV). With your team up three points, and just a few seconds left in the game, the opponent needs a long-distance three-point shot to tie it up. So, it would stand to reason, you should prevent the other player from taking that potentially heart-breaking heave by fouling him before he has a chance to shoot the ball. In the college game, that usually sends the opponent to the line, forcing him to make the first free throw, and then miss the second one intentionally with the faint hope of grabbing an offensive rebound and tying the game before the buzzer sounds. There's no denying that the chances of that scenario succeeding are a lot slimmer than nailing a last-second three pointer. Need proof? Talk to Xavier. On Saturday, the Musketeers were about to pull off the biggest upset of this year's tournament, against top-seeded Ohio State in the South region. But with his team up 62-59 and 9.3 seconds left, Xavier's Justin Cage missed a free throw. The Buckeyes rebounded, and as soon as Ohio State's Mike Conley Jr. crossed mid-court, Xavier coach Sean Miller should have ordered a player to gently hack his hand. But no one did, and Conley handed the ball off to Ron Lewis, who sank a top-of-the-key three to send the game into overtime  and his team onto an eventual victory. In last year's Sweet Sixteen, Washington had a three-point lead against UConn with eight seconds left to play. Rather than send a UConn player to the line, Washington let Rashad Anderson hit a three-pointer with 1.8 seconds left to tie it. UConn won in overtime. And on it goes. "It's a no-brainer," says CBS commentator Mike Gminski, who starred at Duke and played 14 years in the NBA, of the fouling strategy. "There are so many scenarios that have to happen for fouling to backfire, while if you don't foul, a three-pointer to tie the game is much more routine." Coaches in both the college and pro games offer various reasons for refusing to foul when up three. Cal coach Ben Braun, who teeters between the two tactics, nervously rattles off the risks of fouling another player. What if an 18-year-old kid gets too amped up and really whacks a points guard, causing the ref to whistle an intentional foul, which gives the opponent both two foul shots and the ball back? (Though after the no call last weekend on Ohio State's Greg Oden, who practically gang-tackled an Xavier player, it's hard to imagine anyone getting whistled for an intentional foul). Or what if his player fouls too late, while a guard has already started his shooting motion, giving him three foul shots and an easier chance to tie the game? What if the opponent actually sinks that three, offering an opportunity for a rare four-point play and, gasp, victory? Worry much, coach? "That's your job," says Braun. But a coach's job is also to give his team the best shot of winning, and especially in the college game, that means fouling to prevent a last-second three-point attempt. College players, after all, have become so ridiculously proficient at three-pointers that many hoops afficianados argue that the line needs to be moved back further, from its current location of 19-ft, 9-in. from the basket to either the international 20-ft., 6-in. foot line or pros' most challenging 23-ft., 9-in. marker. What's more, if you teach your kids to foul in practice, as Braun insists he does, those risks should be greatly diminished. Still, it's amazing how many coaches just won't buy it. Another anti-hacker is Bucknell coach Pat Flannery, whose teams upset Kansas and Arkansas, respectively, in the '05 and '06 tournaments. He trains his defense to trap the good shooters, and doesn't want to risk a bad bounce on the second foul shot. "You've worked your tail off for over 39 minutes, and to foul at that point, for some people it's a great strategy, but for me, I'm too much of a Republican," he says. Meaning conservative, I assume? "Absolutely. Maybe there are some Democrats out there that could do it, but I couldn't." Fair enough, Flannery. But for my (tournament pool) money, those Sweet Sixteen coaches should be leaning left every time.